You decided to get behind the wheel of a Maserati because you care about thrilling performance, sleek style, and the ability to turn heads. At one Tampa Maserati dealer, we’re helping you get more of each of these out of your Ghibli, Quattroporte, or Levante. How? 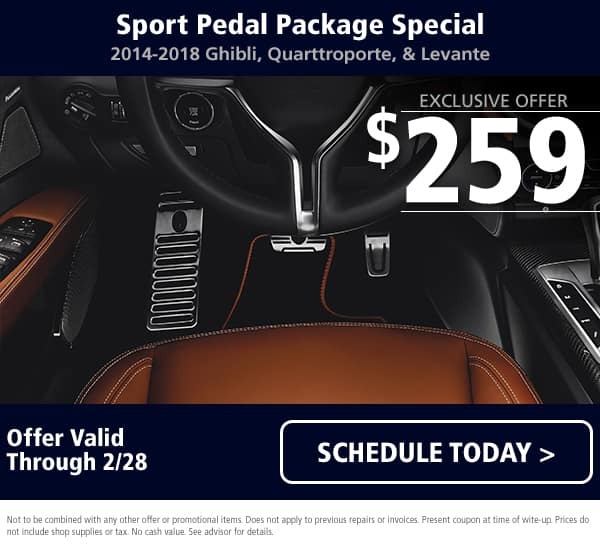 By offering a unique special on the Maserati Sport Pedal Package. What is the Maserati Sport Pedal Package, and what does our special entail? Read on to learn more. While most dealerships offer this package for $400+ or even $500+, when you get yours from Maserati of Tampa, you pay an exclusive $259. But this offer is only available for a limited time. You can get this low price only until February 28th, so act fast. Our highly trained and experienced technicians know how to diagnose your vehicle accurately, then provide dependable maintenance and repairs. We use ONLY Maserati Certified Parts to ensure that you enjoy nothing but the best. Our high-volume service center is capable of working on more vehicles at once than your average dealer. This allows us to get you in and out faster. The bottom line is that at Maserati of Tampa, you get more: more experience, more expertise, more selection, more speed, and more specials. 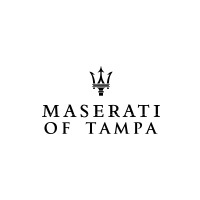 It’s no wonder our clients call us the leading Maserati dealer in Tampa – because they’ve come to expect more. Keep in mind that this special is only on for a limited time. Use our convenient online form to schedule the installation of your Maserati Sport Pedal Package, or call Maserati of Tampa at (813) 375-3564 today.